Reliable fraud enquiries co-ordinated by extremely experienced Australian Investigators. where the owner is infirm or if you are in any of these situations, or you are otherwise concerned that you may become the victim of property fraud, seek advice from a professional conveyancer such as a solicitor or a Citizens Advice Bureau and consider taking action.In order to do this you will need reliable information - Contact us immediately. One of the several type of scams and frauds hovering around is the one faced by homeowners. A property fraud scam or real estate scam involves a scammer or fraudster creating a bogus deed from sample documents and then registering the deed at the land record office. All this happens while the real home owner is completely unaware of the scam. Scammers use fake names and fake identities to carry-out such a fraud. When all the documents have been collated by the fraudster, the next step is to apply for a mortgage. It has been found that in many such cases the scammers have eluded the security checks and disappeared with the money. After a few months when the loan payments become overdue the authorities contact the real homeowner and informs them that a foreclosure proceeding is about to start. This leaves the homeowner with no other option but to hire a lawyer to stop the foreclosure proceedings. 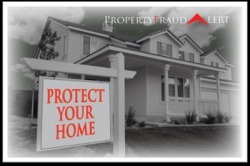 One of the ways to stop this property fraud scam is the timely detection of such a fraud. Scammers and fraudsters wait for a few months after recording the deed and before applying for a loan, this is the time when such a property fraud scam can be avoided.